When this comic book volume first arrived, my immediate thought was that he was related in some way to Iron Man, which made me a bit reluctant to pick up this comic book. But when I started reading, I was immediately intrigued by his character. It was interesting to see a hero skilled more in hand-to-hand combat. I found myself growing quite intrigued by Danny’s personality and his past. The first comic allowed me to get to know him through his past… and while he had a similar tragic past to many of the other Marvel heroes, I thought his origin was a particularly intriguing one. Even if I did find myself getting a bit confused at times. Although it was different to read a comic that used the second person POV, I didn’t feel it worked very well. It was an interesting use… but I didn’t feel it drew me in. The second set of comics, without that, worked much better. It was nice to see bits and pieces about the history of the Iron Fist, but I was left quite confused by exactly what the Iron Fist’s purpose was by the end. I also would have liked to see more of Danny interacting with many of the other characters. There were a few scenes with Danny and Luke, which were good, because I haven’t had the chance to see Luke yet. And I thought it was also good to be able to see the aftermath of the Superhero Registration. It was good to see that Danny was struggling to figure out who he could turn to for help and that he was clearly affected in a negative way by choosing not to register. I did think that Danny was a bit too much like Tony in his ‘other’ identity. It was interesting to see the big part HYDRA was playing in trying to take over his company, though I was left with some confusion about who was on whose side by the end. It was nice to see the two different styles of artwork and I found the second set of comics drew me in really easily. 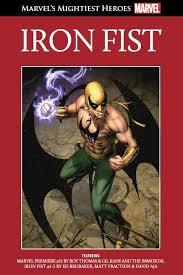 I’m not sure I’ll go out and buy Iron Fist’s whole arc… but I wouldn’t mind seeing him again in future comic books.